The Kingdom of Cambodia, as it is officially known, is found in Asia and bordered by the Gulf of Thailand, Vietnam, Laos and Thailand. With around 15 million citizens it is a moderately sized country that has seen a lot of changes of the years. 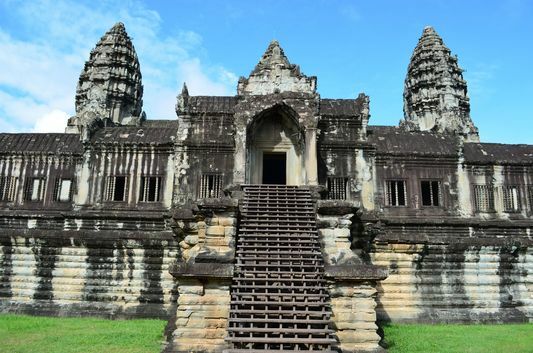 A Buddhist country, it is best-known for Angkor Wat – a temple that attracts millions of backpacking and standard tourists each and every year. This World Heritage Site has history and romance in abundance – not to mention grandeur. Some say that it encompasses all the elements of a Pharaoh, the Pyramids and the Taj Mahal thanks to the luxury, impressiveness and beauty seen across the sprawling 500-acre site. Since opening in the 12th century it has always been a place of worship and was initially dedicated to Vishnu. It is believed that this sophisticated piece of architecture was created to be a replica of the universe. A big question was how the stones used in its building were taken from the sacred Mount Kulen to the temple in such a short timeframe. 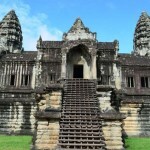 The Khmer empire was supremely powerful in its day and used canals to aid transportation and there is a network of some 21 miles that connects the two and quarries en-route go to back up this claim. Taking just 30 years to construct, it was King Suryavarman II who oversaw it and experts feel it was built to be a funerary temple for him. In terms of positioning, the west orientation would symbolise the setting sun – and, thus death – which supports this believe. We have all seen pictures of the area but the unrestored Ta Prohm is easily the most photographed temple here. Known to be one of the favourites is at the Bayon temple where a Bayeux Tapestry-esque tale tells a long story. Widely regarded as a trip of a lifetime the whole thing is enchanting. Whether you are on a budget or looking for a stylish package, there are all manner of options to choose from. Try to get to the Angkor Wat early to see the sunrise.